Grooveshark Day was awesome this year! Strongsville High School students got their own special promotion, as well as a video which was played on the announcements. Here is a picture of everyone at my school and who wore their shirts and came to get a picture at 7am. Also, we gave out 200 free 1-month VIP accounts on Twitter and on Facebook. 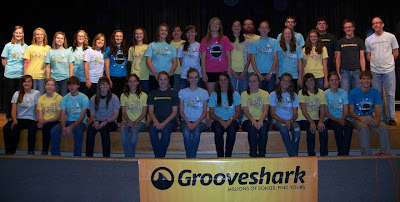 Be sure to stay tuned to http://groovesharkday.com/ and @groovesharkday for announcements for next year!